The war has raged for far too long. four armies converged, fighting for the precious crystals, and none have given up any ground. Fighting has made extraction difficult. the planet continues to provide valuable resources, and so, the forces remain. Battling fort control. With no sign of ending the struggle, all four factions have developed new tactics and technology to further their advantage. 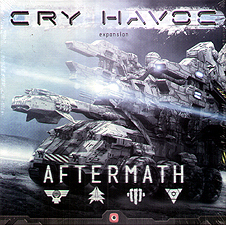 Cry Havoc: Aftermath is an expansion for the critically acclaimed Cary Havoc. Inside you will find new structures and skills as well as powerful new Leaders. Use new tactics and abilities to craft a new battle plan. Will you be the victor, or will your opponents prove too powerful?